After stocking up on supplies and finding a couple of letterboxes in Flagstaff this morning, we headed north for our first trip to the Grand Canyon since the mid-1990s. Whereas many canyons are formed as rivers course forcefully through mountains, the Grand Canyon was incised into an elevated plateau. Its location in a desert landscape means all those layers of rock are exposed to view with scant vegetation to hide them. Though it is one mile deep and 277 miles long, the Grand Canyon is not the world's largest (Australia and Tibet claim bigger ones), but it is certainly the best known. The canyon and surrounding area became a national park in 1919, and it has grown in popularity ever since. More than 6 million visitors from countries the world over make their way to Arizona each year to peer into this vast chasm, six million years in the making. Like many park visitors, our first stop after entering the south gate near Tusayan, AZ, was Mather Point, near the main visitor center. Unlike most of the south rim of the canyon, the trail in that area is equipped with guardrails to prevent the hordes of visitors from slipping over the edge. The viewpoint afforded choice photo ops, and visitors were taking turns along the railing to capture their Grand Canyon group shots and selfies. But for some people, it just wasn't enough. We watched as a young couple strolled around the guardrail and out to the edge of a steep precipice to get a closer look into the canyon, and more importantly to create a boast-worthy photo to post on social media. Numerous other groups followed them to the precarious posing area. In one crew, a young woman was wearing four-inch platform sandals! Later at the visitor center we chatted with a ranger about the foolhardy behavior we had observed. When we asked how often visitors die in a fall over the edge, he replied wryly, "Only once. We've never had anyone fall twice." On a more serious note, he was quick to explain that park officials cannot protect visitors from their own bad judgment. (There is a very different response from rangers if a child is being endangered.) Along much of the rim, there are no railings. Visitors can and do walk to the edge, and some slip and fall to their deaths. According to his statistics, however, the vast majority of the deaths in the park are not caused by falls from the rim. Visitors are much more likely to die from heat, medical problems, suicide or air crashes than by slipping over the edge. Could people have thought the actresses survived their drive into the canyon? 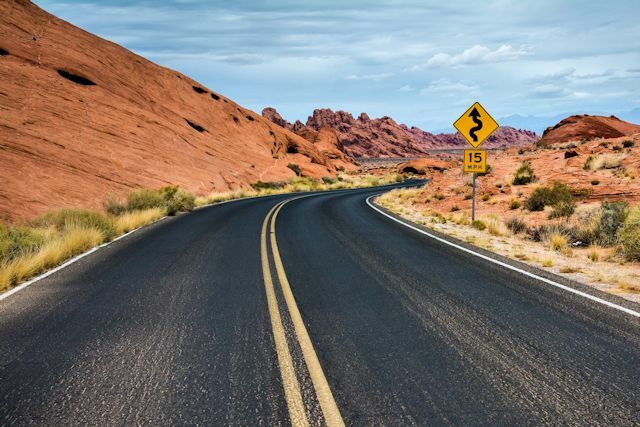 He did relate a rash of suicides by auto after the release of Thelma and Louise, including a couple who rode their Harleys to the area, rented a convertible, and launched themselves into the canyon a la Thelma and Louise. A number of these wrecks were removed recently when a heavy lift helicopter was brought to the park to deliver HVAC equipment to Phantom Ranch, a historic lodge nestled at the bottom of the canyon. Shaking our heads in amazement over some of his stories, we left with a better understanding of why rangers at Grand Canyon perform more rescues than at any other national park, sometimes as many as 300 helicopter rescues a year. 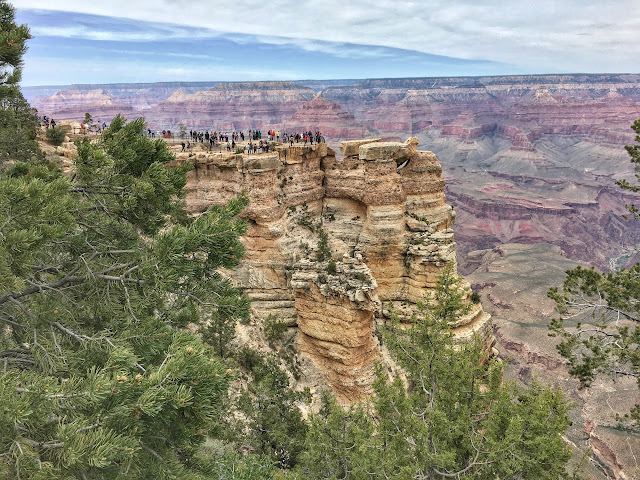 With several roads into the park closed this time of year and through the summer, we hopped on a free park shuttle and rode toward the east end of the south rim to check out some of the view points there and hike the rim trail. For someone with my healthy respect for heights, certain parts of this vertiginous trail sent a frisson of fear shooting up my spine. When the only thing preventing you from stepping over the edge is a five-inch tall rock, you know you're on your own. But we loved hiking the trail and the spectacular views it afforded. By day's end we had walked a little over six miles at an elevation of 7,000 feet, just a bit outside our wheelhouse. We were both exhausted yet thrilled that we had taken another look at this legendary natural wonder. After spending tonight in Tusayan, just south of the park entrance, we'll drive back into the park tomorrow and explore the western half of the south rim as we make our way northeast toward Monument Valley on the Utah border. It's another place we checked out on that long ago visit that we want to see again. Learned: On average only two visitors (out of more than six million) fall to their deaths at the Grand Canyon in a year. Considering the risk and lack of barriers, it's really remarkable.